Why the Campaign to Silence Frank Gaffney? “If you’re not taking flak, you’re not over the target.” So my brave friends who were Navy pilots used to say, when I was safe at sea on a submarine. After many years of standing against America’s enemies, first in wartime and then in national politics, I find that observation apt when hysterical charges are hurled at some fearless truth-teller. A fusillade directed at the messenger usually signals that someone is desperate to silence his message before the rest of us wake up to danger. Nothing gives a disrupter the upper hand, as Saul Alinsky said in “Rules for Radicals,” like isolating, stigmatizing, demonizing, discrediting, and thus “freezing” a troublesome opponent. Such is the explanation, I believe, for the relentless stream of smears and sneers against my friend and fellow Reaganite conservative, my comrade in arms in the battle for the free world, Frank Gaffney of the Center for Security Policy. So here is the truth as I know it firsthand. Here is the Frank Gaffney that the Left and the Islamists are frantic to prevent Americans from hearing, so much do they fear his testimony. The Frank Gaffney I know is an American patriot with a record of service to his country over the past forty years, both at senior levels of government under President Reagan and, subsequently, in the non-governmental public policy arena. Over that time, his positions and prescriptions have engendered more than their share of controversy and ad hominem attacks. Why is that? I submit it has been because he was recognizing and calling for action on problems that were at the time widely unacknowledged or misunderstood. Yet he has been proven right again and again – a vindication in which, as Frank has remarked to some of us, he takes no satisfaction, as it would have been far better for the country if his warnings were not borne out. The attacks on Gaffney have been especially virulent in connection with Islamic supremacism, a frequent subject of his writings, media appearances, and the work of the non-profit policy research organization he founded in 1988, the Center for Security Policy (CSP). Starting before 9/11, and intensifying since then, CSP’s efforts to sound the alarm about the rise of the global jihad movement, about the various ways in which it pursues the triumph worldwide of its animating ideology, shariah, and about how those techniques might be most effectively countered, have infuriated Islamists. They and some others, particularly on the Left, have found it easier to denounce the “watchman on the wall,” rather than challenge the substance of the factual information Frank Gaffney and his colleagues have presented. The effort Frank Gaffney has led to thwart the sort of influence operations described in the Explanatory Memorandum has presented extensive – but all-too-often unexamined – evidence of Islamic supremacist penetration of both Republican and Democratic circles. That evidence identified, on the Right, as one enabler of such penetration, Grover Norquist, the ubiquitous conservative organizer – and on the Left, among others, Huma Abedin, an individual with extensive personal and family ties to the Muslim Brotherhood who has been influentially positioned, through her close association with Hillary Clinton, to shape American policy. It’s hardly surprising that, as these and other connections were exposed, the Muslim Brotherhood has resorted to ever more strident attacks on Gaffney. If even half of them were believed, he would have little remaining credibility. Yet I can attest, having known and worked with Gaffney over the years, that he is unfailingly scrupulous in his methods, forthcoming in sharing the facts behind his analyses and those of the Center for Security Policy, and persuasive in explaining the conclusions drawn. His enemies, however, brook no such discussion or dialogue. They are bent on simply silencing him, from motives that are easy to infer. Q.1: Is Frank Gaffney a conspiracy theorist? A.1: He is nothing of the kind. Gaffney deals in realities, not theories. There’s a simple difference between someone obsessed with wild unfounded fears of nefarious plots, and someone needfully warning about an actual and dangerous conspiracy (for there are such things, as history shows). The difference comes down to facts. Frank Gaffney and the Center for Security Policy he founded in 1988 have spent nearly three decades marshalling those very facts – facts about the plans and activities of America’s very real enemies, foreign and domestic. Mockery can’t wish those enemies away. The scoffers either are unfamiliar with the realities and the prodigious work done by the CSP team to document them, or simply hope to discourage others from evaluating them and taking appropriate actions in response. Documentation that this conspiracy to impose sharia worldwide has been underway in the United States since the early 1960s has been verified by the U.S. Department of Justice and established in federal court in the Holy Land Foundation prosecution of 2008. Introduced into evidence in the course of that trial was a secret plan laying out that mission and the stealthy, subversive techniques by which it has been pursued for decades. This strategic plan, known as the Explanatory Memorandum, was written in 1991 by a top Muslim Brotherhood operative, Mohamed Akhram. This Memorandum explicitly describes the Brotherhood’s conspiracy to penetrate and subvert America’s civil society institutions and government agencies. The Center for Security Policy has published ten books and monographs in recent years documenting the conspirators’ success in executing that seditious strategy. (These products can be downloaded for free at SecureFreedom.org.) The willful blindness or deliberate deceptions of those who deprecate this work is no excuse for responsible Americans to do the same. Conspiracy theorist? Hardly. I see Frank Gaffney more as a modern-day Paul Revere, urgently working to awaken his countrymen to the rising threat before it’s too late. Q.2: Is Frank Gaffney a racist, bigot, hater, or Islamophobe? A.2: None of those, not by any stretch of the imagination. Gaffney has indeed been called all these names, usually by Islamic supremacists and those on the Left who consort with the Islamists and enable their anti-American agenda. Leading the charge has been the once-respected Southern Poverty Law Center. Strangely, SPLC has abandoned its former mission of protecting civil rights and become little more than a fundraising machine and instrument for political warfare against conservatives and other patriotic Americans, including Frank Gaffney and the Center for Security Policy. Frank tells people that far from being consumed with hate, he is motivated by love – love of this country and our way of life, our Constitution and the freedoms it guarantees. It is a sad irony that a group like the SPLC, whose initial raison d’etre was defending those freedoms, is now willingly used by liberty’s sharia-adherent enemies to try to suppress or destroy it, starting with freedom of speech. Q.3: Does Frank Gaffney claim that Barack Obama is a Muslim? A.3: Absolutely not. Gaffney and CSP have no more definitive information about President Obama’s religious beliefs than everyone else (although boyhood school records do list him as a Muslim, according to reports in the Associated Press and the Los Angeles Times). Gaffney is on record as having repeatedly said that the important thing is not what Obamaprofesses in faith, but what he is doing in policy with the effect of enabling Islamic supremacists who threaten Americans and their vital interests. Whether Mr. Obama actually is a Muslim or simply plays one in the presidency may, in the end, be irrelevant. What is alarming is that in aligning himself and his policies with those of 5 Sharia-adherents such as the Muslim Brotherhood, the president will greatly intensify the already enormous pressure on peaceful, tolerant American Muslims to submit to such forces – and heighten expectations, here and abroad, that the rest of us will do so as well. Undiplomatic? No doubt. Provocative? Quite purposely. But not a word of untruth, an iota of hyperbole, or a scintilla of illogic. Just blunt as a bulldog and honest as daylight; that’s my friend Frank. Q.4: Has Frank Gaffney contended that Barack Obama was born in Kenya, like the so-called “birthers”? A.4: Never. Gaffney has no firsthand knowledge of President Obama’s birthplace and has never asserted he did. He did make, in October 2008, some factual observations relevant to the debate then occurring about candidate Obama’s personal history, just ahead of that year’s presidential election. He was referring to evidence that had surfaced that Mr. Obama was born in Kenya, including a 1998 client list for his publicist, then called Jane Dystel Literary Management. So Gaffney wasn’t citing allegations by the future president’s detractors, but statements by Obama’s own representatives, whose born-in-Kenya claims dated both from that 1998 document and from an earlier 1991 booklet issued by what was then known as Acton & Dystel. This evidence may have been less than conclusive, and it was denied by Obama and his defenders, but there it is in the public record. 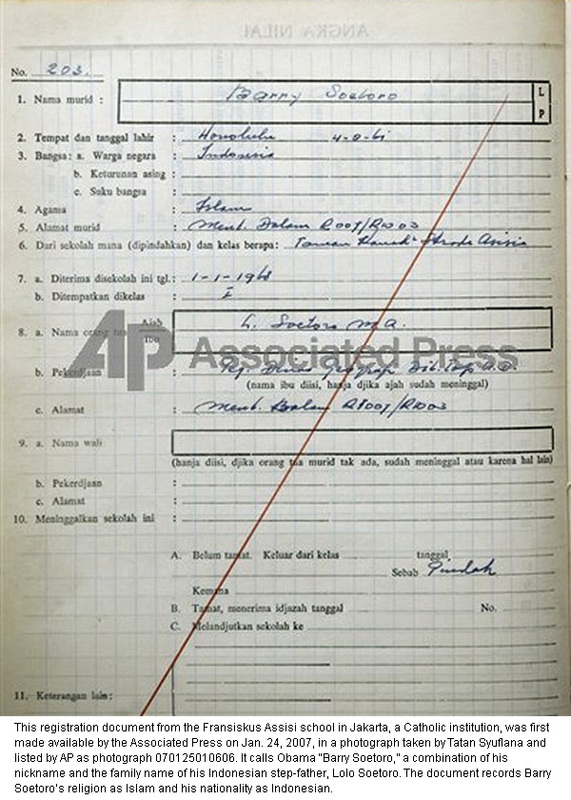 The same is true of another piece of evidentiary data, of which Gaffney wrote in 2008: “There is also a registration document for a school in Indonesia where the would-be president studied for four years, on which he was identified not only as a Muslim, but as an Indonesian.” The registration can be seen in this document from SD Katolik Santo Fransiskus Asisi, a Catholic school in Jakarta. Q.5: Did Frank Gaffney say it was treasonous for Gov. Chris Christie to appoint a Muslim attorney to a New Jersey judgeship? A.5: He did not say that. Gaffney’s criticism of various actions by Christie, before he became governor and since, though sharp, never took that form. In 2008, for example, Frank strongly disagreed with Christie, then a federal prosecutor, for dispatching his deputy to testify as a character witness for a virulent Islamic supremacist, Imam Mohammed Qatanani, during deportation proceedings being conducted by the Department of Homeland Security. That intervention contributed to Qatanani, whom Christie has called his “friend,” being allowed to remain in this country, endearing the would-be governor to the Muslim Brotherhood and those Muslim voters in New Jersey under its sway. Once in office in 2011, Gov. Christie appointed to the state judiciary Qatanani’s Islamist lawyer, Sohail Mohammed – a man who had worked for the American Muslim Union (AMU), an organization with close ties to Hamas. The governor responded to widespread criticism in New Jersey and beyond by lashing out at his critics as racists and bigots, the sort of ad hominem attacks generally employed by Islamic supremacists and their leftist allies. It was then that Frank Gaffney, interviewing Andrew McCarthy on Gaffney’s syndicated radio show, asked the former federal prosecutor whether knowingly appointing a person to the bench who had been associated with a front for a designated terrorist group could be considered “misprision of treason” – i.e., ignoring, and thereby enabling, treasonous activity. A tough question, but under the circumstances a fair one. A reasonable inquiry on points of law, not an accusation. Q.6: Did Frank Gaffney claim that a logo redesign at the U.S. Missile Defense Agency must reflect Obama’s Muslim views? A.6: Certainly not. This canard arose when Gaffney wrote a February 24, 2010, column for Breitbart.com titled, “Could This Possibly Be True?”. It made a teachable moment of an assertion circulating at the time on the Internet that the Missile Defense Agency (MDA) had recently adopted a new logo that appeared eerily to combine the colors and themes of Barack Obama’s 2008 campaign logo with the crescent moon symbol of Islam. The point of the column was not that the imagined provenance of the new MDA symbol was true – it subsequently was established not to be – but, rather, that the Obama administration was, in any case, wreaking havoc on the nation’s missile defense programs, accommodating Iran’s nuclear ambitions, adopting Islamist memes, and otherwise accommodating Islamic supremacists. Regrettably, each of those points have proven to be true. In addition, the indignant voices raised against Gaffney’s logo column predictably ignored an awkward fact that came to light a few weeks later. It turns out that President Obama did direct an agency involved with rockets and space to embrace his determined effort to curry favor with Muslims. It’s just that it was the National Aeronautics and Space Administration, not the Missile Defense Agency. The tactic of pounding the table and changing the subject when you have a weak case has seldom been better illustrated than by apologists for Barack Obama’s soft stance toward the global jihad movement. It’s much easier for them, obviously, to focus on demonizing the Frank Gaffneys of the world than to justify to a puzzled public their President’s belief that he has a “responsibility… to fight against negative stereotypes of Islam.” What? Q.7: Did Frank Gaffney accuse Huma Abedin, a key staffer for Hillary Clinton, of being a terrorist? A.7: Never, and any such claim is but another instance of Islamist apologists throwing dust in the air to distract people’s attention. However, Gaffney is indeed one of those – including, again, counter-jihad expert and former federal prosecutor Andrew McCarthy – who have documented the extensive personal and family ties to the Muslim Brotherhood of Secretary Clinton’s long-time aide, Huma Abedin. These ties are symbolized by the identification for some twelve years of Ms. Abedin as an associate editor on the masthead of the journal of her family’s business, the Institute of Muslim Minority Affairs (IMMA). This institute was set up first in Jeddah, Saudi Arabia under the sponsorship of and with resources from the Saudi-financed World Muslim League that were secured by a top Muslim Brotherhood operative and al Qaeda financier: Abdullah Omar Naseef. For at least seven years, Naseef’s name was listed as a member of the Journal of Muslim Minority Affairs’ advisory board, close by that of Ms. Abedin. Interestingly, the mission of the IMMA is to promote the Brotherhood goal of discouraging assimilation by Muslims in non-Muslim nations. As has been evident from a string of recent horrors in Europe, keeping Muslims separate from the larger population facilitates efforts to foster memes of alienation, grievance and victimhood – and the sharia-adherence, miscalled “radicalization,” that often flows from such narratives. Insofar as the United States government has yet to designate the Brotherhood as a terrorist organization, Huma Abedin can’t be strictly considered as terrorist-linked. Her long association with that organization would, however, qualify her to be considered a civilization jihadist. Which ought to concern Americans more – the ominous closeness of so suspect a person to someone who may well be our next president, or the Center for Security Policy’s alleged impoliteness in asking pointed questions about such a woman? Q.8: Did Frank Gaffney claim Grover Norquist is gay? A.8: He certainly did not, nor does that matter interest him in the slightest. But the wellconnected Norquist, president of Americans for Tax Reform and an NRA board member, has been repeatedly called out by Gaffney as an enabler of the Muslim Brotherhood’s stealthy subversion of the United States. The factual basis for that charge is laid out in a dossier published by the Center for Security Policy under the title, Agent of Influence: Grover Norquist and the Assault on the Right. Among those who have attested to the damning nature of that evidence are former U.S. Attorney General Michael Mukasey, former Director of Central Intelligence R. James Woolsey, former Congressman Allen West, former Commander-in-Chief, Pacific Fleet Admiral James “Ace” Lyons, former Deputy Under Secretary of Defense for Intelligence Lieutenant General William “Jerry” Boykin and former federal prosecutor Andrew McCarthy. I have endeavored throughout the seventeen years in which I have raised an alarm about Mr. Norquist’s conduct [with respect to his longstanding and ongoing relationship with individuals and organizations tied to the Muslim Brotherhood and other Islamist causes] to address that conduct – not the individual in question’s personal affairs or activities. Claims to the contrary are baseless. The issue is what he has done, and is doing, in his professional capacity. Q.9: Was Frank Gaffney or the Center for Security Policy banned from attending the Conservative Political Action Conference (CPAC), or from speaking there? Falsehoods to the contrary stem from moves by Grover Norquist and one of his Muslim Brotherhood-associated colleagues, Suhail Khan, to retaliate against Gaffney for the 9 latter’s efforts to expose and counter their Islamist-enabling influence operations. Both have repeatedly used their influence with the American Conservative Union, the Council for National Policy, Coalitions for America, the Washington Times, and other organizations to attempt to silence and ostracize Gaffney. Regardless, Frank Gaffney and the Center for Security Policy did participate actively in CPAC 2016, just as they did at CPAC in previous years. Additionally, Gaffney was honored with the George Washington Military Leadership Award from the Council for National Policy in 2016 and with the Stephen H. Long Award from the Western Conservative Summit in 2015. And he remains a member in good standing of the Conservative Action Project. Norquist’s allies’ efforts to marginalize and silence Gaffney have, in short, failed. Q.10: A final question, then: Has any one American taken more flak from Islamists and the Left, with less justification, than Frank Gaffney? A.10: No one that I know of. Indeed, few others are even close. Unrelenting, undeserved abuse has surely been heaped upon such brave truth-tellers against jihad and shariah as Steven Emerson of the Investigative Project on Terrorism, Daniel Pipes of the Middle East Forum, and Congressman Peter King of New York. Brigitte Gabriel endures intense hatred, unbowed. Pamela Geller survived a jihadi attempt on her life. So did the ex-Muslim Ayaan Hirsi Ali, who is not actually an American but an asylum-seeker on these shores after having to flee both her native country of Somalia and her adopted homeland of the Netherlands. But Gaffney has been the object of a more sustained barrage from Islamists and the Left than all of them. What should hearten him and them, amid the storm, is that this treatment from those forces can only be worn as a badge of honor. Because, remember: if you’re not taking flak, you’re not over the target. John Andrews has been president of the Colorado Senate, founder of the Western Conservative Summit, and an appointee of four Republican presidents. He currently leads a newly formed citizens advocacy group, Americans for America, and chairs the Center for Security Policy’s Counter-Jihad Advisory Board.